On Thursday May 20, thanks to all of your donations we received, I made the first of what I hope to be THREE fleece blanket deliveries to Cooper Cancer Institute in Voorhees New Jersey. It was a day I won’t soon forget. There has not been a day that has gone by since I walked out of the Institute that I have not thought about the chemotherapy patients, and their smiles, loads of smiles. With that very thought in mind today I bring you two patients of the many I met that day, while delivering your fleece blanket donations. This is Fran Ceritano who is currently receiving chemotherapy treatment. She is a wonderful lady, with a beautiful smile. I love the blanket she chose, one that was hand sewn. I loved meeting her and her daughter. I wish her all the best as she moves forward with her treatments. Another patient I met while at the Cooper Cancer Institute was Bill Duncan. I talked for a while with Bill about his cancer and met his wonderful wife who was with him. When I asked Bill if I could take a photograph and tell his story on the layers of love website & blog he did not hesitate to answer a resounding “Yes!” He wanted his story told because he said that “if he could give anyone, even one person who has cancer hope, that is exactly what I want to do.” Bill described to me that he currently has stage 4 small lung cancer extensive, left lung, right lung, effected, abdomen, and a spot on his kidney. Before his first of three chemotherapy treatments his tumor measured 12.7cm x 4.5cm. After first three treatments his tumor has reduced in size to 4.5cm x approximately 2.0 cm. 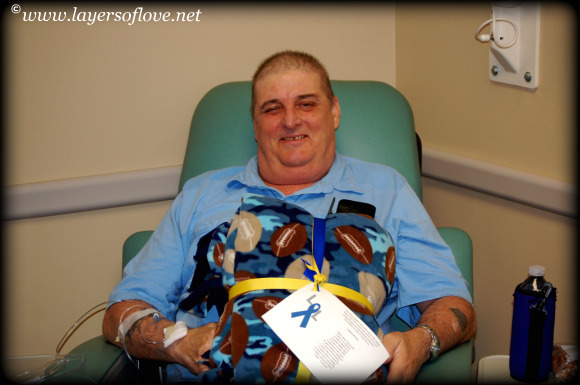 Bill said that “the treatments do work.” Bill was an amazing man with an inspiring positive outlook. He also went on to say that he “is reacting good to his treatments” and “the one thing you must have no matter what when diagnosed with cancer is a positive attitude.” “When I was diagnosed the doctors told me I have 12 months, after these first three treatments I am now telling them, I have at least 12 years!” Bill’s positive attitude radiated from him. Bill and his wife, and Fran and her daughter, were a joy to spend time with and wonderful to talk to. I am so glad I got to met them and everyone I had the pleasure of meeting and talking with on that day. I wish Bill and Fran all the best as they move forward with their treatments. I was told last week that all the fleece blankets that were delivered on that day have now been handed out to patients. 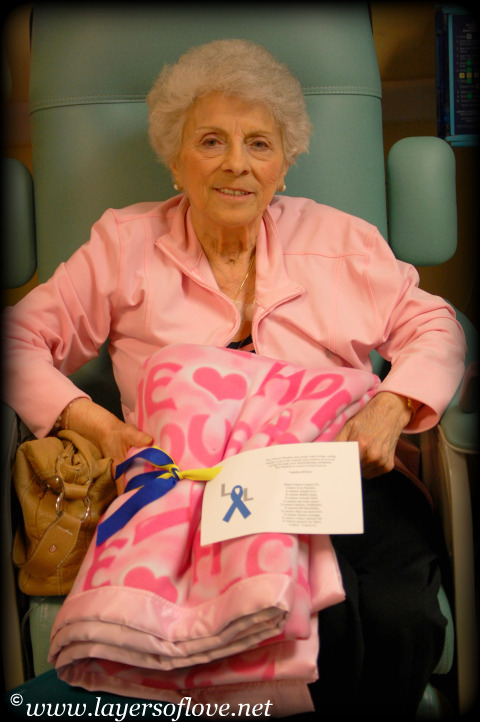 It was wonderful to give a patient a blanket and see their face light up and for them to immediately put them to use. YOUR generous donations have made a huge difference to these chemotherapy patients. YOU have made it possible for them to have comfort and warmth as they go forward with their treatments. We cannot thank you enough for all the donations we have received. We are a third of the way to reaching our goal. There is still time to help us out, donating is as easy as a few clicks of the mouse. Check out our sidebar for blanket donation suggestions, you can purchase them right from here and have them shipped directly to us. If you have any questions please don’t hesitate to ask us, send us an email at: donations@layersoflove.net We thank you for all your help! This entry was posted in Donations, Uncategorized and tagged attitude, cancer, chemotherapy, Cooper Cancer Institute, difference, Donations, fleece blankets, goal, help, positive, thank you. Bookmark the permalink.